It was early in his career that Marc Chasin learned a critical lesson in change management. While deploying an EHR system into his practice, he had trouble getting buy-in from one of the partners — his father. From that experience, “I learned how to engage stakeholders appropriately,” said Chasin, who is applying those lessons at St. Luke’s, where he is leading an Epic transformation. In this interview, he talks about what it’s like to hold dual roles, the invaluable role of physician leaders in change management, and the innovative work his team is doing with telemedicine and population health management. He also discusses when he realized his affinity for IT, his passion for being involved, and how moving to Idaho has changed his perspective. As we move from volume to value and we’re in two business models, compensating these clinicians for their time when you can’t necessarily bill for the service is going to be a challenge. IT is pervasive in every single health system function. Nothing gets deployed or billed without some sort of IT component, so I’m involved in a fair amount these days. It’s what I love doing, and it feels right. I find more and more that my work is engaging people around a vision or a common goal on how care can be better with the utilization of technology. Having a parent try to change is a difficult feat in and of itself. And so I learned how to approach things. I learned how to get buy-in and I learned how to engage a stakeholder group appropriately. Gamble: I’m glad that you just touched on that. I wanted to talk a little bit more about that. I can imagine the role that telemedicine has to play when you are talking about some really remote areas. What are some of the initiatives you have or have planned? Chasin: We are involved in deploying broadband to the majority of the state. As a rural state, we can’t deploy technology unless we have the cables running on it. We have a broadband issue in the state, so we’re trying to work through that. What we’re doing is we’re getting involved in telepsychiatry. We have deployed our eICU system to help critical access hospitals for patients that can’t get to a tertiary care center. The idea is that we want to push care as close to the patient’s home as possible. In the near future we will be deploying technology that allows patients to access care further into their homes and develop an initiative similar to a hospital at home in which they may be able to bypass a sub-acute nursing facility and be monitored using this type of technology. Gamble: When you’re talking about having to deploy a broadband, how does that work from a funding standpoint? Do you have to partner with different companies for that? Chasin: We have to partner with the main cellular companies as well as the cable operators. It’s been one of the major roadblocks that we have seen in the State of Idaho right now. Gamble: Right. And of course the other component of telemedicine is the funding. Is that something that’s been a challenge just in keeping these programs going? Chasin: We were fortunate enough to be awarded one of the CMS innovation grants a year and a half ago, which got our telehealth project started. But as we move from volume to value and we’re in two business models, compensating these clinicians for their time when you can’t necessarily bill for the service is going to be a challenge. This is why we’re working on developing new methods of contracting with physicians and understanding where health care is going and how to leverage our providers and our nurse practitioners and our PAs to practice at the highest aspect of their license. Gamble: It’s of course a tricky issue because you’re not going to see the ROI upfront, but you are certainly going to see it in the longer term outcomes and things like that. Chasin: That’s correct. If we could reduce our per-member, per-month cost and premium throughout our community, we’ll know that we’ve made some significant improvements. Gamble: You have this ongoing integrated network initiative, which I can imagine takes up a great deal of your time is spent on that. Are there other projects that we haven’t talked about that you’re also looking into? Chasin: I am in the midst, as is everybody else, in remediation of our IT programs for ICD‑10. We are preparing for October 1. I am also in the process of redeploying our ERP system and engaging the organization on time and attendance, as well as new practices in IT. IT is pervasive in every single health system function. Nothing gets deployed or billed without some sort of IT component, so I’m involved in a fair amount these days. Gamble: Several of the CIOs that I’ve spoken with have said that with so much on their plates, a lot of them depend a lot on the CMIO. But in your case, that’s you. Do you have kind of some really key staff members that you do lean on just to help with everything going on? Chasin: I sure do. I have a good staff on the technical side — my IT directors — and I have a very engaged group of clinicians that have taken on the role of informatics and change agents. I rely on them heavily and I meet with them very frequently and they give me feedback on what’s going on with the end user. So I feel that I’ve been able to balance both roles very effectively with the excellent leadership that I have in the organization. Gamble: Like we said before, it’s something where you do see the convergence of the two roles so it does make sense, but I can imagine that it also makes for a lot on your plate. Chasin: It does, but it’s what I love doing, and it feels right. Gamble: Looking at your previous experience at Bon Secours. It looks like you were able to rise through the ranks and you said you started to build an affinity for the IT component. Just kind of take us through that a little bit just as far as taking on the different roles and how you got more into the IT side. Chasin: I realized that I had an affinity for IT in my first two weeks of residency when I noticed that all of the first year residents were working up a pneumonia patient differently, and that if I had deployed a single order set, it would have standardized a lot. That’s where my first foray into this convergence of IT and medicine was explored. I went through family medicine residency then went to work for myself in my own practice, and there I started to build my own electronic record as well as early ePrescribing. I started to see how practice protocols and sharing data between clinicians in your own office to be very beneficial. At that time, I progressed in my career and got involved in hospital administration. I was the CMO and VP of Medical Affairs at the Bon Secours Charity Health System, which is in New York. There, we looked at ways that clinicians can drive down variation and improve care, whether it be in the ICU or whether it be in mortality reviews. That was where I really started to get my affinity and see that it is not necessarily about technology; it’s about engaging people in better process redesign. The technology portion is only maybe 5 or 6 percent. Once I started getting involved as the CMIO, and now ultimately the CIO, I find more and more that my work is engaging people around a vision or a common goal on how care can be better with the utilization of technology. Gamble: That’s really interesting, especially how you developed your own EMR. I’m sure that was a big learning experience. Chasin: It was a learning experience in a couple of ways. It was a learning experience in that I probably wasn’t the best person to develop my own EMR. And secondly, one thing I learned about key change management pieces is that one of my partners was my father, and having a parent try to change is a difficult feat in and of itself. And so I learned how to approach things. I learned how to get buy-in and I learned how to engage a stakeholder group appropriately. Gamble: That’s really interesting. I imagine that really laid some serious groundwork for the roles that you would get into. Gamble: So one of the big questions I had was what brought you to Idaho, and what it was like, because I can imagine that was a big transition. Chasin: It was probably one of the best moves I’ve made in my life, from both a personal and a professional perspective. This organization is fantastic to work for. It is an organization that truly believes that we can change the way health care is given and received. When I moved from the East Coast, there were a lot of different health systems. I was in one of the smaller ones — at least in my region — and I was moving to one of the larger health systems in the region now where I am in Idaho. And so I have some different exposure. I have different influence both at the state level and at the local level, and I did not have that opportunity where I originally was. Gamble: Sure. As far as lifestyle, I’m sure it’s probably different than it was on the East Coast. Chasin: I am one mile away from my office. Chasin: It’s been a very big change from when I lived back east. Gamble: Did you have any reservations about making a pretty big change? Chasin: I didn’t. I looked for this change. I looked to make an impact. And the organization that I came to felt right when I interviewed here. Gamble: With so much going on and so much on your plate, is it difficult to maintain a healthy work-life balance at this very busy time in the industry? Chasin: I have to make that a priority. As you speak probably to anybody, work and personal life at the CIO role tends to blend into one another, but I make a point to spend time with my wife and my kids, and they understand when I have to attend to work. But overall, I think my life-work balance improved once I moved out here as opposed to back east. Gamble: I can see that. I’m trying not to generalize too much, but I imagine that in some areas it is more of a priority to get out of the office, and that’s a good thing. 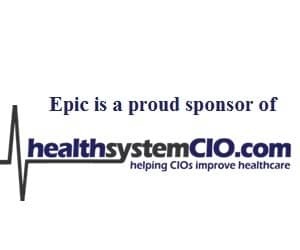 Gamble: In terms of what it’s been like to take on the CIO role, do you have any final thoughts on this time in the industry — in terms of everything that’s going on and the very exciting direction in which healthcare is moving? Chasin: I think this is a fantastic opportunity. I’ve learned over the past year an enormous amount that I never thought I would learn in medicine. I think this is a time for the CIO to step up and be a leader within the organization. I feel that I have this opportunity now, and that many organizations are craving leadership and direction. I feel that that’s one of the areas where I’m going to excel and help drive change and organizational improvement. Gamble: Any words of advice for others who are new stepping into the CIO role? You talked about leadership — maybe seeking education or things along those lines that can improve leadership abilities. Chasin: I try to do as much reading as I can on leadership and leadership practices, whether it be emotional intelligence or servant leadership. But what I can recommend is talk to as many people as possible — you want people to know more than you, and to learn every single place that you go. Gamble: In terms of leadership style, is it safe to say that you’re somebody who has an open-door policy and really encourages a lot of communicating? Chasin: All the time. My door is always open. Gamble: Yeah. I would guess that just by talking to you. Gamble: Okay, I know we’ve touched on a lot, so I don’t know if there’s anything else you wanted to add, but I wanted to thank you so much for taking the time to speak with us. Chasin: Thank you. It was my pleasure. Gamble: It’s been great to hear about everything that you’re doing out there, and I hope that we can catch up with you again down the road. Chasin: That would be fantastic. Gamble: All right, thank you so much and best of luck.